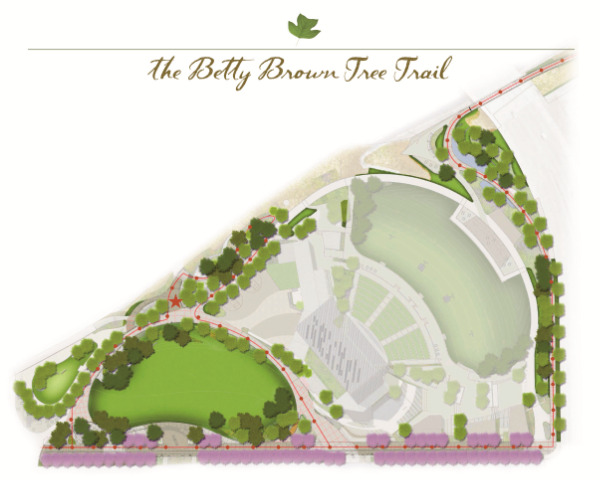 Nashville Tree Foundation is thrilled to announce the opening of the Betty Brown Tree Trail and Arboretum in Summer 2015 in conjunction with the newly developed Riverfront Park and Ascend Amphitheater. Named after founding board member and first president, Betty Moorhead Brown (1939-2011), the trail is Nashville's first downtown arboretum. With 263 trees representing 36 different species, it meanders along the perimeter of the park then loops through garden space. Trailhead is located at the Riverview Gardens of the Park. Look for the signage at the red star on the map below. Created in partnership with Metro Nashville Parks, the Tree Trail reflects Betty Brown's formidable impact on Nashville's urban tree canopy. Betty was also a visionary who helped redevelop the original Riverfront Park. She led the Nashville Tree Foundation as president from its founding in 1986, stepping down in 2010. The Betty Brown Tree Trail and Arboretum was made possible by gifts in the name of Betty Brown to the Nashville Tree Foundation and by friends and family. A $250,000 grant gift - that includes monies in addition to funding from the USDA Forest Service and the Tennessee Department of Agriculture, Division of Forestry - also endows tree maintenance for at least 15 years post contractors' warranty. What will you see at the trail? For your convenience, Nashville Tree Foundation has developed a guide pamphlet for the Betty Brown Tree Trail that lists the tree species and what to look for along your way. You may pick up one at the visitor's kiosk at the park or download one here. Tree Trail Tours will be available each month.